One of the largest fish in the world. Females can reach 14ft. in length and weight more than 1800 lbs. Average sizes tend to be in the range from 11ft. and 200-400 lbs. Known for putting up a tremendous fight when hooked, it is not uncommon to see this huge fish heave itself skyward in a seemingly inexhaustible display of strength. 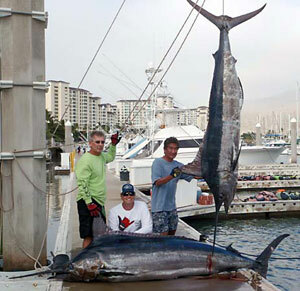 These rare marine monsters are the holy grail for sport fishers. A popular sport fish in many parts of the world and is praised for their speed and strength when fought on rod and reel. This fish is among the world’s hardest running fish. A long battle can be expected from this freight train. 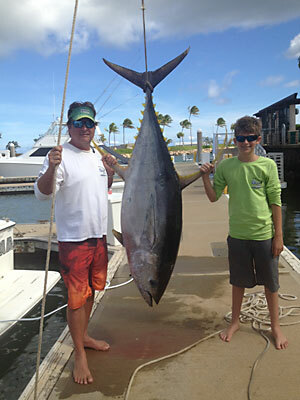 Reaching weights of over 300 lbs, many anglers believe that large yellow fin are pound for pound the fastest and strongest of all big game tuna. Notable features are their long orange-yellow streamers and yellow finlets that make this trophy fish so attractive. Prized for its popularity amongst sushi lovers. This Marlin family member is named due to its glowing vertical bands. It is perhaps the most colorful of the billfish family. Found only in the Pacific waters, the striped Marlin provides a memorable battle with much aerial display. Found in warm waters worldwide, the Dolphin is among the most colorful of the game fish. 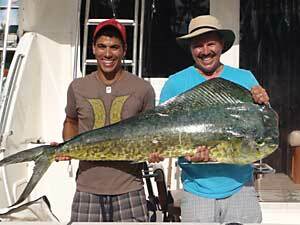 Its hard fighting and gold-green and blue colors makes this fish one of the most popular mounts. The males (bulls) are known for their distinctive blunt head while the female (cow) has a rounded head. Mahi Mahi is amongst the most popular fresh fish served in restaurants because of its variety of different ways in which it can be prepared. 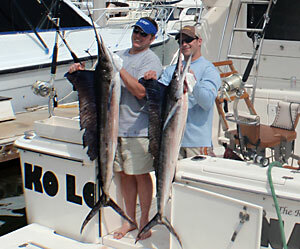 Wahoo is a game fish known for its long hard runs at speeds up to 45 mph. 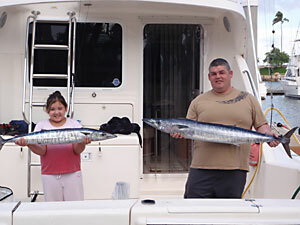 Because of the limited number of Wahoo caught, it is truly a trophy fish. This fish is noted for its blue vertical stripes. A local favorite for grilling. 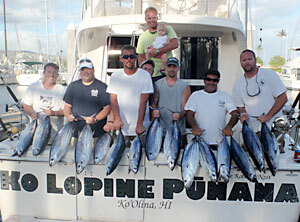 The skipjack tuna exhibits all the characteristics of the voracious feeders and high energy and strength of the tuna family. The vivid swirls of black against the dark blues give it perfect camouflage to attract its prey. This catch is mostly enjoyed pan-fried or sashimi style (raw).